Dr. 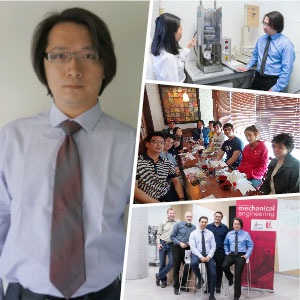 Sunny Leung has joined the York University in 2013 as an Assistant Professor in the Department of Mechanical Engineering. Since 2014, he has also been serving as the Undergraduate Program Director of the Department. Dr. Leung is an emerging researcher in the areas of micro-and-nanostructuring of advanced polymer material systems as well as the development of smart and multifunctional materials. He has close to 100 scientific contributions, with 27 of them in peer reviewed journals. Three of his recently published papers were featured in the front cover and inner cover of the Journal of Applied Polymer Science, which is the one of the largest scientific publications in polymer science. Moreover, his two other journal articles were recognized as the top cited papers in the Journal of Supercritical Fluids and Chemical Engineering Science. Currently, he is serving as a member of the Academic Advisory Group and Co-op / PEP Governance Committee in the Lassonde School of Engineering at the York University. He is also serving as the chair of the Undergraduate Program Committee and a member of the Graduate Program Committee of the Department of Mechanical Engineering at York University. Furthermore, he has provided other university services as a member of hiring committees for a number of faculty members.